Home Alexa Blogger SEO How To Guides PageRank Updates Traffic How To Manage Bounce Rate Of Your Blogger's Blog? 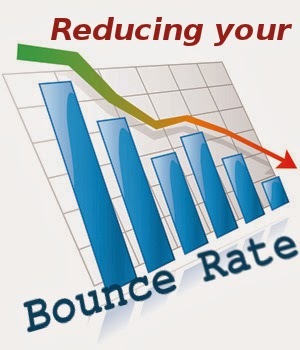 How To Manage Bounce Rate Of Your Blogger's Blog? Bounce Rate is a very important term for Blogger and Webmasters to keep an eye on and to take care of. If you don't know about it, then in this post, we'll give you its introduction and the tips to manage it. What Is The Term 'Bounce Rate' Mean? In Google and Alexa Analytics, it shows some of the stats. For example, if your blog's bounce rate is 50%, it means half of the traffic visits your blog thinks that your blog is not much informative and they don't need to visit anymore pages. In simple words, 50% of traffic on your blog just visited one page. What is Best Bounce Rate Level? Every blogger has a wish that the traffic on his/her blog stays forever. In that condition, you have to take Bounce Rate down. Reaching 10% - 30% is a best Bounce Rate. How To Decrease Bounce Rate? If the content on your blog is good and useful. Than it is easier for you to take down the bounce rate to more less. But if you have ever copied content on your blog, it could be a big trouble for you to take down the bounce rate. Linking to related pages of your blog is a good way to cut half of your bounce rate. Linking other related blog posts through Anchor text is good way of SEO and a good way to decrease bounce rate. If someone can visit to aforementioned pages, he/she may also visit to other pages as well, if content is useful and informative. But be careful, don't link your blog posts too much if you really want to stay away from Google Penalties. They dislike too much interlinking with older blog posts. If you will link your blog to other blogs, the traffic might start visiting to those blogs instead of keeping with yours. But if you think that the other source is very much useful to your blog post, than you can go for linking it with your blog. Doesn't matter. Nowadays, many bloggers are thinking that putting too much ads on their blog can earn them a lot of money. But unfortunately, not. Putting too much ads on a blog kills a blog. Remember, don't do such mistake. Putting 3 4 ads on each page is fine. These widgets will put attention of your visitors on other posts of your blog. Hopefully this post has helped you a lot. Keep visiting IncomeFigure!